SIRUBA7200 Direct Drive Lockstitch Industrial Sewing Machine. Suitable for light, medium & heavy work with fabrics such as cotton, leather, silk, synthetics plus more. 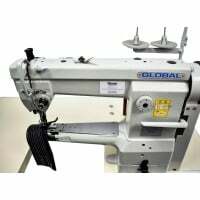 This industrial sewing machine is recommended for tailoring, curtain makers, fashion designers, alterations shops, bridal shops, schools, colleges, home, & dry cleaners. 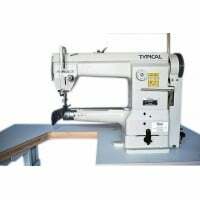 - The machine has a clear control panel and two additional function keys with the needle (sewing back and adding stitch). Mini System with Direct Drive servo motor provides quick start sewing, precise positioning, low noise and saving electricity. Safety switch. Protects against accidental starting the machine during maintenance work (when the machine head is tilted). The wide field of work for easy movement on the fabric. Low energy consumption. This saves energy by 35%, relative to the V-belt. Automatic lubrication mechanism ensures durability, even at high speeds. Rotary cutter thread is suitable for various types of thread. Equipped with an electric winding thread. Key half-stitch is set inversely over the button for easy use. The maximum stitch length to 4 stitches per inch. The machine uses a new mechanism Wiper (nipper) holding the thread at the beginning of sewing. The new mechanism also allows the use of more diverse instrumentation.